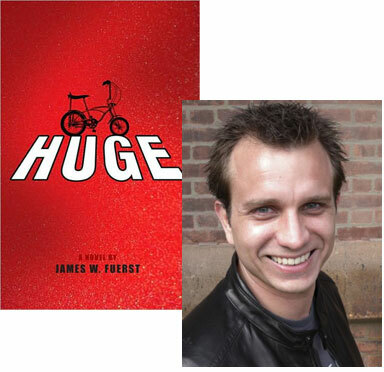 Full disclosure: Soon after I started reading an advance copy of James W. Fuerst’s debut novel, Huge, earlier this year, I immediately glommed onto the idea of getting him to come in for the reading series I’ve been curating and do a theme night devoted to literary novels with adolescent protagonists. That idea didn’t pan out (although the event I wound up producing was a success), but I’m still interested in seeing what other readers will make of Fuerst… and when the opportunity to learn more about how Huge came into being presented itself, I didn’t hesitate. When I first got the idea for Huge, I’d been living in London for about seven months or so and had experienced a couple of surprises. Before my wife and I had even arrived there, I’d landed an interview for a teaching position at a university in London, and we took up residence in the U.K. with a good deal of anticipation. That I didn’t get the position wasn’t the surprise—the academic job market is like playing basketball against a much taller person; rejection is a big part of the game—but that none of the many CV’s, resumes, and applications I sent out from that point forward resulted in anything at all, not even so much as an e-mail confirming receipt, well, that was surprising. I’d never earned much money in the various jobs I’d held over the years, but I’d never been unemployed or without prospects, either, so the experience was kind of new to me. But I was in luck. My wife’s job kept us from being homeless and starving on the streets of a foreign country, I’d already begun working on a novel, and I now had time to devote to it, or at least a bit of time until something else panned out. So, I wrote; I wrote a lot, actually, ten to twelve hours a day, six days a week. It did not go well. After a few months, it began to dawn on me that my first attempt at a novel was turning into a monstrosity, an unsalvageable mess; it was ponderous, convoluted, plodding, and dull, and, worst of all, it was supposed to be a comedy. Why I’d expected anything else is really anyone’s guess, but I have to admit that I had the gall to be surprised. I decided to take a short break from the first project—which, like Huge, I’d intended to be a kind of detective story with humorous elements—to try to write something that was actually funny. I cheated a little by reading some novels in Terry Pratchett’s Discworld and Gregory McDonald’s Fletch series, among others, and then by giggling my way through an anthology of short stories edited by Maxim Jakubowski called The Mammoth Book of Comic Crime. There are a number of gems in that collection, but Mat Coward’s “And the Buttocks Gleamed by Night,” about a hard-boiled cat detective, had me laughing for days. More than that, Coward’s story seemed to shake something loose for me, or perhaps simply cleared something out of the way, because I started writing Huge, as what I thought would be a long short or a novella, pretty much immediately. At the time, my wife, who is a lawyer, was working on a case in Zurich that kept her in Switzerland Monday through Friday over a five-month stretch. When she returned to London on the weekends, I would have our flat all clean and tidy and a nice meal ready and waiting for her—remember, I was unemployed—and, at some point over the next couple of days, I would read her the latest installment of what I had written. Her keen interest in the work was a welcome change from the quizzical, side-eyed glances and grumbling that the earlier project had so frequently elicited, and her repeated requests for me to write more helped me to realize that I had enough material to extend Huge into a full-length novel. Since I’d already taught a college writing seminar on the “Art of Detective Fiction,” I was well versed enough in the genre to know where I wanted the rest of the work to go, and from there it was basically re-reading Raymond Chandler’s novels while trying to imagine what is conspicuously absent from them—how Philip Marlowe actually became Philip Marlowe—from the perspective of a twelve-going-on-thirteen year-old boy growing up by the Jersey shore. But that’s a different matter, I guess, and a little far a field from the surprises I experienced in London. 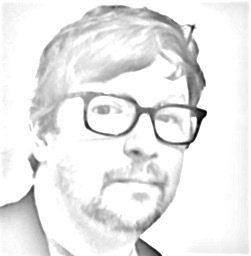 Just over three years there and I never landed a job; my first attempts at a novel were almost comically inept; I did some reading to get the juices flowing, got a different idea, and ran with it; I had all the support and encouragement a person could want along the way, far more than I deserve; and I got a novel, a novel that I enjoyed writing, out of the bargain. It wasn’t all that easy, of course, but that’s neither here nor there. It was a good time, a productive time, and I hope at least some of that comes off for anyone who reads Huge.